Ralph Randall, by whom given to the present owner. London, Redfern Gallery, Alan Reynolds, January 1956, no. 99. 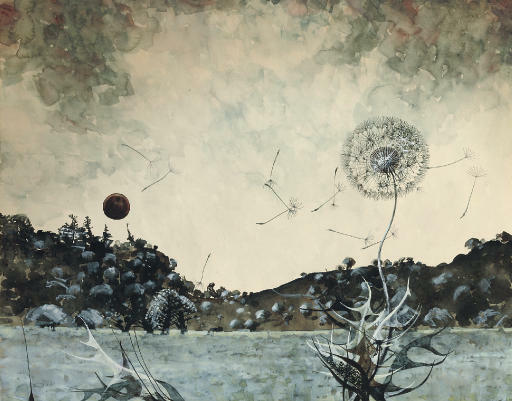 In 1960 Eric Newton described Reynolds'’s early work: 'He began as a landscape painter, to whom the distant sky, the level meadows, the thistle or the ears of corn within reach of his hand were objects to be described with the precision of which only an analytical love of such objects is capable'’ (quoted in exhibition catalogue, Alan Reynolds Towards a Retrospective: from early landscapes to abstraction, London, Thomas Agnew, 1982, pp. 2-3.) Reynolds'’s preoccupation was to penetrate and represent the principles of nature in his figurative landscapes: to respond to, and depict that artistic response, to the sense of the beautiful and meaningful in nature (see also the note to lot 10). Please note that the work is also numbered 'II' (lower right, underneath the mount).